Who ever thought I would start off a hockey post with a memorable lyric from Boyz II Men in the early 90’s of my teenage fandom? However, it feels appropriate today as one era closes and a new one begins. That’s exactly where the Rangers are as they prepare for Game 63 of 82 tonight in Vancouver at 10 PM. They’ve said goodbye to Rick Nash, Michael Grabner and former captain Ryan McDonagh along with J.T. Miller. Nick Holden too even though he’s yet to play for Boston which makes the return of a third round pick and Rob O’Gara look pretty good. Of the five former Rangers, the hardest to say goodbye to is McDonagh. A valuable player with character who brought plenty of it to Broadway after being stolen by Glen Sather from Bob Gainey in the Scott Gomez salary dump. Gomez is retired and a Islanders assistant coach. McDonagh is a proven player who will add a lot to the Lightning defense. The pressure won’t be as great due to anchor Victor Hedman playing top pair with Anton Stralman. One of those ex-Rangers from the 2014 roster that went to the Stanley Cup. Once he’s ready, McDonagh will find himself on the second pair with familiar pal Dan Girardi. It’ll probably feel like nothing changed for the former shutdown tandem who were largely responsible for three deep Rangers runs in ‘12, ‘14 and ‘15. They played on broken body parts in a gut wrenching seven game series loss to the Lightning in the Conference Finals three years ago. Why does that feel like much longer? Many will testify that life moves fast. In some aspects, I agree. It doesn’t feel that long ago that I was a senior in high school celebrating the Rangers Stanley Cup victory at the parade down the Canyon of Heroes 24 years ago. But much has changed since then with the sport that now includes 31 teams and too many rules changes to keep track of. Simplicity was better. Maybe it’s only me. The golden age of Rangers hockey featuring Henrik Lundqvist since 2005 has been fun. The team has made the postseason 11 out of 12 years. That will change in April when this team won’t qualify. That’s life. The Stanley Cup Final against the Kings and great run in stunning the Caps with their third 3-1 comeback in two years on the tying goal from Chris Kreider, winning goal from McDonagh in Game 5 at a wild MSG remain. Everyone knows the amazing ending with Derek Stepan winning the second round series in overtime on Garden ice. What if they had taken care of business at home against Tampa? All they needed was to win Game 5 or 7. Instead, they were shutdown literally with the Bolts posting two shutouts to basically end the Rangers run. I think deep down, we all knew it. As hard as it was to grasp even after all the injuries were revealed, they were valiant going as far as they could go. Sometimes in sports, teams don’t win. It doesn’t mean they weren’t successful. There are plenty who never got over the hump. Recent Mets teams are the primary example. You only get so many chances to be a champion. Not everyone wins. It’s a fact we don’t want to admit. What’s worse is knowing how much the former players cared. When you see what they say about their time spent here. McDonagh penned a emotional goodbye to the Rangers and fans while at a airport today in the Players Tribune. It included a classic story about the traffic in the city on what was Game 5 of the 2012 Conference Final versus the Devils. Of course, he was with Stepan and Marc Staal and they weren’t getting anywhere. They made it in time for John Tortorella’s pregame meeting. The part that got to me is how much it meant to McDonagh to see the ‘C’ stitched on that blue Rangers jersey when he was named captain replacing Ryan Callahan, who he’ll now be reunited with and chase a Cup in Tampa. So will Miller, whose time ran out in New York due to wild inconsistency this season despite ranking second in team scoring. "To actually see the C stitched on that blue sweater … what can I say? There are no words." It’s going to be strange to see five ex-Rangers wearing the uglier dark navy colors of the Lightning. Eventually, that will be the case with McDonagh joining Callahan, Girardi, Miller and Stralman. Like McDonagh said, it’s part of the business. He knew he was getting traded which explains why he took down his Twitter account and stayed away from the team. It was probably very stressful and hurt a prideful guy who wore his emotions on his sleeves. There’s a misconception that McDonagh wasn’t the best captain. He might not have been the emotional in your face type on the ice. But he was always pretty vocal following games in the locker room. Seeing how down he was following the Islanders embarrassment told me everything I needed to know. He called it “my worst game,” and spoke about how embarrassed he felt. It reminded me of a emotional Stepan following last year’s second round elimination to Ottawa. He pointed the finger at himself for not being good enough. Maybe deep down, he knew he was gone. That’s the thing. We may get on these guys too much. We don’t know the first thing about what they go through before, during and after games. The core has been split into pieces that are now mostly on other teams looking to help them win. Only four players remain from 2014. They are Lundqvist, Staal, Kreider and Zuccarello. Kevin Hayes was part of 2015 as a rookie. Everyone else is long gone including inspirational leader Martin St. Louis, who might one day become an assistant coach since retiring after 2016. In the cap era, this is what happens to successful teams. Even if you don’t win it all, you must make hard decisions moving forward. GM Jeff Gorton knew this was a possibility which is why he dealt away Stepan last summer in similar fashion to moving Derick Brassard before their no-trade clauses kicked in. Now, Brassard is a member of the hated Pens due to the awful handling of the Senators, who eventually will trade superstar captain Erik Karlsson this summer a year removed from losing to the Pens in sudden death of Game 7 of the Conference Finals last year. Stepan is stuck on the rebuilding Coyotes as a leader. That’s how quickly things can change. Following their 2012 run to the Stanley Cup Final in McDonagh’s first full year, the Devils haven’t been back to the playoffs since. Now, they’re going back barring something unexpected. Their rebuild worked. With Lundqvist about to turn 36, he doesn’t want to miss the playoffs for long. He’s got three years remaining on his contract that pays him an AAV if $8.5 million thru 2021. It’s up to management to do a good job drafting and developing the right pieces. First round picks Lias Andersson and Filip Chytil are a big part of the future with both likely Blueshirts as soon as ‘18-19. Gorton now has three first round picks for this year’s NHL Draft including his own which could wind up in the top nine. He can look to move up and also use the three seconds and three thirds. With McDonagh officially gone, the pressure shifts to second-year defenseman Brady Skjei to learn on the job and develop into a top pair guy. It won’t be easy. Staal and Kevin Shattenkirk are the only vets left on the blueline. If both stay, they’ll provide leadership along with Zuccarello, Kreider and Hayes. I don’t know how long it will take for the new Blueshirts to be competitive again. If this month is any indication, we’re in for some tough times ahead. On the final day of February, the Rangers enter tonight’s game having lost 13 of 15 (2-12-1). I’ll miss McDonagh the most. He was terrific as a top pair D who logged a ton of minutes playing every situation. That’s not going to be easy to replace. I wish him the very best as I do all the former players who brought so much to the table. McDonagh thanked us earlier in that letter. No. Thank you Ryan! It was a pleasure. 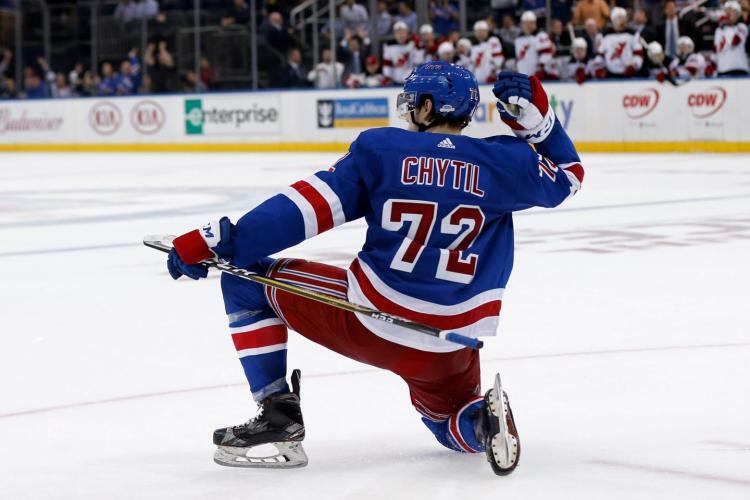 This entry was posted in Column, NYRangers and tagged Anton Stralman, Chris Kreider, Column, Dan Girardi, Derek Stepan, Derick Brassard, Henrik Lundqvist, J.T. Miller, John Tortorella, Lightning, Marc Staal, Mats Zuccarello, Michael Grabner, Nick Holden, Rangers, Rick Nash, Ryan Callahan, Ryan McDonagh, thank you. Bookmark the permalink.